Watercolor Kit: Color Your World Release! Get ready to color your world with out latest kit! It's apt called Color Your World and it's a brand new kit concept from Maya Road Kits! This kit is bursting with amazing product including the fabulous Ken Oliver Crafts Color Burst line. It's all about adding watercolor techniques and styles to your projects. Color Your World is our latest stunning kit and we're excited to share it with you today. It's a unique kit that makes YOU the artist creating beautiful watercolor projects. All the fabulous trims, embellishments, dies and Color Burst as well as the fun exclusives make it easy to just open the package and get creating. We'll guide you along the way with beautiful samples and instructions and tips so that you can jump in and get that watercolor look you want. This time we are even adding videos to show you just how easy it is. All our kits are limited edition so if you want it, make sure you purchase it right away. Quantities are limited. You can also check it out in our Kit YouTube video! We think you'll agree it's a pretty amazing kit and what's even more incredible is the price! Full of more than $60 of supplies, we're selling it for only $39.99 plus shipping ($6.00 in the US). Our Color Your World Kit Add-ons. So many of the products in the Color Your World Kit are just so fabulous we thought you might want to be able to purchase a few extras. Purchase any or all of the add-ons at the same time you purchase the kit and we'll mail them at the same time with no additional shipping charge! Want to expand on your Color Burst collection? These secondary colors are available for purchase separately and round out the original Color Burst palette. We love using them with a close primary shade for subtle Color Burst blending! Platinum Color Burst?! Yes!!! This gorgeous Color Burst adds shimmer and shine to your Color Burst projects and adds an amazing new dimension to each piece! Caribbean Color Burst comes in a six-pack of gorgeous color! These colors just make us swoon with delight. We are dreaming of sun soaked days by turquoise waters. These colors are the latest and greatest from Ken Oliver Crafts. Need brushes? This trio of amazing waterbrushes features three different brush sizes. They also have a barrel that holds water so that you don't have to keep dipping. Simply fill the brush with water then press lightly to release the amount of water you need. You can never have too much watercolor paper on hand! This add-on includes 8 half-sheets of the same watercolor paper that's in the kit. We love this beautiful with love die set and it makes beautiful sentiments whether you watercolor them or not! These tassels are hot, hot, hot! Released a couple months ago from Maya Road, these beauties are on trend and flying off the shelves. They make an absolutely stunning and unique embellishment and even make darling charms for necklaces and key chains. This add-on is for one package of white tassels which includes 8 sweet tassels. Have you tried our paper twine cording? This item brings together twine and paper and it is absolutely amazing dyed with Color Burst! This add-on is for one yard of this gorgeous vintage style lace trim. It is delicate and sheer and stunning and makes a fabulous texture addition to any project. Also try it with Color Burst for a beautiful pop of color! Color your world with these stunning wood butterflies! These beauties are exclusive to this Maya Road Kit so if you want them, now is the time! We adore their beautiful pop of color and they can even be used as buttons! Our designers have a total addiction to these beautiful paper flowers! They go with everything and a great tip is to alter them with Color Burst for a beautiful color pop! Choose from either the bundle of small white flowers that includes 12 blossoms or the bundle of medium white flowers that includes 6. Or you could get it all and have both! The medium size paper flowers are shown in the above photograph. These beautiful iridescent sequins catch the light beautifully and slightly change color as they do. Sequins and watercolor pair up beautifully with their transparent elements and these sequins look stunning with absolutely everything. Caught the die-cutting bug? You'll never run out of sentiments with these beautiful dies on hand! This set, Word Dies, contains 7 die sets of script words that you can mix and match. These script words are perfect for sentiments on both scrapbooking projects and cards. This set of dies regularly retails for $52.50 separately but this set gives you an amazing value at only $44.00! Nothing says handmade and original like a stamp that spells it out for you! If you love signing the back of your custom card creations, this exclusive stamp is perfect for you! It's self inking format makes it a breeze to get a perfectly stamped impression each time! If you're looking for samples of what you can create with this kit, look no further! TWO different designers have created unique card designs to inspire you. Simply click on the following photos and you'll be linked right to their coordinating galleries. Each designer has written full instructions to complete each project. Below you'll find links to the PRINTABLE PDF files that make this kit into a class for you! This kit will ship starting April 27th so you'll be able to get started right away! Click here for a printable PDF of Kay's full project instructions! Click here for a printable PDF of Julia's full project instructions! Card Kit: Sweet Nothings Release! Holiday Crafting Kit: Holiday Treasures Release! Ready to get your jolly on? Your Christmas crafting started? Your holiday glitz and your new year glam? Whatever you celebrate this winter, the new Holiday Treasures Crafting Kit from Maya Road is sure to inspire your creativity and make holiday crafting a joy! Holiday Treasures is a gorgeous mix of prints and textures and all things festive. Snowflakes and silver, stars and shine, chipboard and trims, it's all put together to mix and match and enjoy! All the papers, flair and fun exclusives make it easy to just open the package and get creating. All our kits are limited edition so if you want it, make sure you purchase it right away. Quantities are limited and our holiday kits always sell out! We think you'll agree it's a pretty amazing kit and what's even more incredible is the price! Full of more than $68 of supplies (and that's a low estimate), we're selling it for only $36.95 plus shipping ($6.50 in the US). Our Holiday Treasures Kit Add-ons. So many of the products in the Holiday Treasures Kit are just so fun and fabulous we thought you might want to be able to purchase a few extras. This release we've gone above and beyond with so many festive treats and treasures to choose from! Purchase any or all of the add-ons at the same time you purchase the kit and we'll mail them at the same time with no additional shipping charge! This beautiful chalkboard style washi tape makes an adorable addition to any paper project. It's even fun to put on the seal of an envelope! This add-on is for one roll of the Silent Night Washi Tape. This is one of the most beautiful holiday paper pads ever! With a lovely retro look this paper pad included 24 sheets of 8"x8" patterned paper. We love the larger size! There are two sheets of each double-sided papers with 24 designs in all. We just can't say enough about it and this paper pad is so fab! 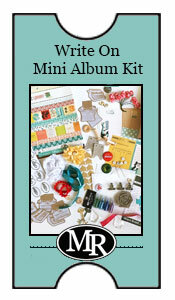 Want to create a mini album with the Holiday Treasures kit? This chipboard mini album is NOT included in the kit so be sure to pick up this add-on. It's a super sweet tag album with 6 heavy chipboard pages. Be sure to check out what designer Jess Mutty created as a design sample with this mini. Absolutely stunning! These beautiful flowers are brand new to Maya Road and are the perfect colors for the holidays. If you're looking for more of these to craft with, be sure to add this add-on to your order. This add-on includes 4 flowers, 2 of each design. Shiny turquoise star sequins are perfect for the holidays and they are also great for birthdays and other celebrations all through the year. Add this lovely little add-on to your cart to add shimmer and shine to many crafting projects. One sprinkle of stars is included in each add-on and shipped in a glassine envelope. Maya Road twines are some of our most popular products. If you've ever tried them, you'll know why! They are thick and heavy twine and make great additions to cards and layouts. Take them beyond and use our twines for packaging your holiday gifts. This add-on is for one roll of twine - 100 yards! Get ready for a countdown or count up with this fabulous set of wood token numbers. This set contains the numbers from 1-31 making it perfect for calendar projects or a December Daily! We love the Maya Road Kits exclusive flair and so do you since we always sell out! The Holiday Treasures kit includes each of these flair pieces but if you like more, this is the add-on for you! It includes 2 of each of all three flair designs giving you six extra pieces of flair in total! Making your own holiday tags this year? Check out this sweet manila tags! There are 10 tags in each of these add-ons. Creating holiday cards this year? The Holiday Treasures kit will have you creating beautiful and unique cards for everyone on your list. This is the place to stock up for card bases and this add-on is for 12 of them. This add-on is included by the special request of one of our Maya Road customers. This sweet shadowbox makes a darling holiday decor piece or an advent countdown project! Enjoy embellishing it with the Holiday Treasures kit! Here's another special request add-on! Do you enjoy hot drinks during the holidays? This sweet metal clip add-on is for a 6 pack of coffee cups! Total cuteness! These stunning burlap flowers are a brand new Maya Road product! And they aren't even in the shop yet! Get first dibs on what is sure to be a hit in this beautiful mix of texture and bling! The rhinestone centers shimmer and shine! This add-on is for a package of burlap flowers which includes two blossoms. Ready for some holiday tokens? This sweet wood tokens are fun and festive and make a great accent. They just scream home for the holidays don't they? This add-on includes 4 wood tokens, two of each design. If you have a die-cutting machine, this add-on is for you! It's also the one add-on that you DO NOT want to miss! Just for our kit purchasers, get early access to one of our hottest new products from Maya Road. Maya Road is carrying dies and these are our fabulous holiday line! This time we are offering the stunning dies as a holiday set. All five die sets for $41.00! If you're looking for samples of what you can create with this kit, look no further! THREE different designers have created unique holiday projects to inspire you. Simply click on the following photos and you'll be linked right to their coordinating galleries. Each gallery has full instructions to complete each project. This kit will ship starting November 11th so you'll be able to get started right away! Click here for printable PDF of Jess' full project instructions! It won't be long until Autumn is breezing it's way towards us. All that beautiful color, crisp mornings and harvest bounty has inspired us to bring you a kit full of fall splendor. Meet Autumn Wonder, a kit that will have you enjoying each cozy moment of fall and its golden glow. Autumn Wonder is our latest stunning card kit and we're excited to share it with you today. It's an elegant combo of timeless and trendy prints and patterns, beautiful textures and fabulous details. All the papers, stamps, flair and fun exclusives make it easy to just open the package and get creating. All our kits are limited edition so if you want it, make sure you purchase it right away. Quantities are limited. We think you'll agree it's a pretty amazing kit and what's even more incredible is the price! Full of more than $52 of supplies, we're selling it for only $25.24 plus shipping ($5.75 in the US). Our Autumn Wonder Kit Add-ons. So many of the products in the Autumn Wonder Kit are just so fabulous we thought you might want to be able to purchase a few extras. Purchase any or all of the add-ons at the same time you purchase the kit and we'll mail them at the same time with no additional shipping charge! There's lots of gorgeous paper in the 6x6 paper pad included in the kit but just in case you can't stop creating, this add-on will come to the rescue. We love the gorgeous color palette and fresh prints! Our custom Maya Road kit flair is always a popular add-on! These pieces are also exclusive to this kit and make beautiful embellishments for your crafting projects. This flair add-on is extra special this release as it has two pieces of flair from the kit PLUS an addition two designs that are completely unique! Include this flair add-on for four additional pieces of flair. We also have sets of 12 white envelopes available for purchase as an add-on. These envelopes fit a 4.25" x 5.5" card size. Due to popular demand, the envelopes are now being offered as an option instead of being included in the card kits. Love may be sweet but check out these darling burlap bags!!! Sweetness defined! Fill them with treats for beautiful presentation or to hold gifts cards or a small mini album! Each bag is 4" x 6" in size. Love our chalkboard stickers? This mini chalkboard marker is perfect for writing on them! It can also be used on real chalkboards as well! The special ink in these pens can be erased with water and a cloth which gives you the look of chalk without the dust and smearing! Do you love that chalkboard look as much as we do?! These little labels are perfect for getting organized or for embellishing your projects. Use them almost anywhere! Now these are CUTE! These darling wood bobbins are a new Maya Road product and make great accents! They are also an adorable way to store ribbon! Glassine Envelopes are always a popular Maya Road Kit add-on! Stock up here as a great way to give treats, hold photos and ephemera or even small gifts! Check out this beautiful lemon seam binding. Note that this particular seam binding is NOT included in the kit but we thought that it coordinated so beautifully that we just had to offer it to you. The seam binding comes rolled on a darling little wood spool making it easy to store. This add-on is a special one! It's not included in the kit and there are very limited quantities so if you want it, now is the time. This exclusive and custom designed self-inking stamp is perfect for personalizing all your beautiful works of heart. Stamp it on the back of your cards and sign them before sending them off or stamp it on the back of layouts or anything you can think of! Each stamp says "Handmade & Original by:" with a beautiful circular border. If you're looking for samples of what you can create with this kit, look no further! THREE different designers have created unique mini albums to inspire you. Simply click on the following photos and you'll be linked right to their coordinating galleries. Each gallery has full instructions to complete each mini album. This kit will ship starting August 30th so you'll be able to get started right away! Here is Caroline's Gallery: coming soon! Fresh colors, office style, florals and a touch of whimsy are the inspiration for our latest Classic Card Kit. Work of Heart is full of wonderful products and exclusives to make it easy for you to create your own works of heart. We know that your creative time is important to you as is creating beautiful things to share with others. Work of Heart is a fabulous kit that's absolutely full of amazing products. We're loving the sweet fresh color combo, trendy flair, darling typewriter transparencies and a fabulous interactive exclusive stamp set. Super cool! There are just so many other wonderful inclusions as well. Work of Heart has all you need to create 6 cards (and more). Papers, trims, stamps, flair and fun exclusives make it easy to just open the package and get creating. All our kits are limited edition so if you want it, make sure you purchase it right away. Quantities are limited. 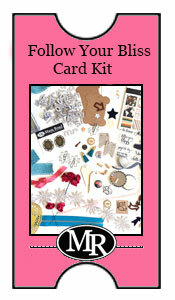 Everything in the above image is included in the Work of Heart Kit as well as card bases to create six cards. Each release one of our most popular add-ons is the gorgeous exclusive flair we include in each kit. This release is no exception with the most lovely, classic and trendy at the same time, be happy and ampersand flair. Each of the flair add-ons includes two of each of the beautiful flair accents! We absolutely love bringing you our exclusively designed wood pieces to each Maya Road kit. This release we have two amazing wood pieces: a beautiful damask wood button and a fabulous handmade with love wood token. This add-on gives you two of each of these designs for more wood fun! If you like stars, these wonderful blackboard star tags are super fun to use! We can think of so many ways to use them and make a fun addition to a gift or any celebration. This add-on includes 10 of these beautiful blackboard tags. These are an exclusive product to this kit so if you want them, this is where to find them. All that glitters is definitely gold! Check out the shine on these beauties! They add instant glam to any project. This add-on includes one package of gold bows (3 in a package). They are a quick and easy way to get that fabulous gold trend on your designs. Can you ever have enough sequins? We think not! This add-on includes a sprinkle of beautiful blue flower sequins encased in this darling Maya Road mini tin. Well aren't these a hoot?! Whoooo can resist these darling Sea Blue Wise Owl Resin Charms? Each add-on contains one package of five wise owls. Don't miss this add-on! This add-on is an extra special one! It's not included in the kit and there are very limited quantities so if you want it, now is the time. This exclusive and custom designed self-inking stamp is perfect for personalizing all your beautiful works of heart. Stamp it on the back of your cards and sign them before sending them off or stamp it on the back of layouts or anything you can think of! Each stamp says "Handmade & Original by:" with a beautiful circular border. Wood Shipping Tags anyone? This add-on is for one package of 8 wood tags as seen in the above image. Paint them, stamp them, ink them, dye them...they are perfect for so many unique projects and of course, the natural woodgrain is a beautiful texture. Lastly we have sets of 12 white envelopes available for purchase as an add-on. These envelopes fit a 4.25" x 5.5" card size. Due to popular demand, the envelopes are now being offered as an option instead of being included in the card kits. If you're looking for samples of what you can create with this kit, look no further! Three different designers have created unique sets of card design to inspire you. Simply click on the following photos and you'll be linked right to their coordinating galleries. Each gallery has full instructions to complete a set of 6 card designs. This kit will ship starting May 10th!